The demand within the global market for corporate wellness has been rising on account of the need to maintain integrity within the business sector, finds Transparency Market Research (TMR). The growing number of corporate entities in the global business domain has played to the advantage of the vendors operating in the global corporate wellness market. The market vendors are capitalising on the mammoth-sized business entities in order to gain business and make profits. The strategies of the market vendors are well-aligned with the goals and objectives of the consumer entities. Furthermore, the market players operating in the global corporate wellness market have been making ardent efforts to tap into the needs of all forms of corporate entities. The leading vendors in the global market for corporate wellness have expanded their service portfolio in order to attract a larger consumer base. Furthermore, these vendors have demonstrated their ability to provide wellness services across businesses through free screenings and seminars. Hence, these vendors have attained a solid position in the global corporate wellness market in recent times. The small and medium-sized vendors in the global corporate wellness market are striving to procure a sound consumer base. The ultimate aim of the smaller vendors in the global corporate wellness market is to generate a regular inflow of revenues within their kitty. 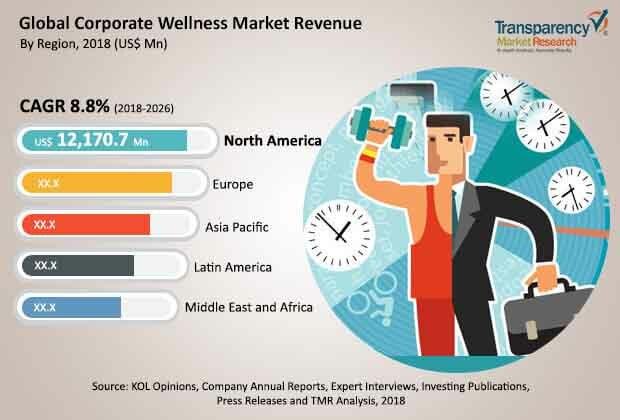 Transparency Market Research (TMR) finds that the global market for corporate wellness would expand at a healthy CAGR of 9% over the period between 2018 and 2026. Furthermore, the cumulative worth of the global corporate wellness market is expected to reach US$ 61,690.9 Mn by 2026, from a value of US$ 29,266.9 Mn in 2017. On the basis of geography, the demand for corporate wellness in Asia Pacific is expected to rise at a starry rate. Corporate wellness is an expansive domain that is meant to add value to the experiences, synergies, and health of employees at an organisation. It is a form of non-monetary service that contributes to the physiological, nutritional, and mental wellness of employees. Smoking cessation campaigns are amongst the most important part of corporate wellness programs. Hence, there is no contention about the fact that the global corporate wellness market would expand at a stellar rate in the years to follow. The global market for corporate wellness shall also expand as employee welfare activities programs gain importance in the corporate sector. Management of stress, disease protection, and proper nutrition play an important role in improving the performance of employees. Hence, nutritional programs and stress management activities are regularly organised across corporate entities. Therefore, the global market for corporate wellness is projected to expand at an unprecedented rate in the years to come. Furthermore, vaccination and blood donation camps are also organised to generate awareness amongst corporate staff. It is expected that the revenue index of the global corporate wellness market would significantly improve in the years to come. The review is based on TMR’s report titled, “Corporate Wellness Market (Service Type - Health Risk Assessment, Fitness, Smoking Cessation, Health Screening, Weight Management, Nutrition, Others (Stress Management, Disease Management, Vaccination, etc.)) - Global Industry Analysis, Size, Share, Growth, Trends, & Forecast 2018 – 2026”.